Download "Chapter 17 review. Multiple Choice Identify the letter of the choice that best completes the statement or answers the question." 1 Chapter 17 review Multiple Choice Identify the letter of the choice that best completes the statement or answers the question. 1. Which of the following resulted in a retaliation by the United States of increased tariffs on cheeses and meats from Europe? a. Smoot-Hawley Tariff of 1930 c. Beef War of 1999 b. Chicken Tariff of 1963 d. Steel Tariff of What was the result of the Bretton Woods Conference? a. the creation of a fixed exchange-rate system for the United States and much of western Europe b. the creation of a flexible exchange-rate system for the United States and much of western Europe c. the creation of the euro d. the creation of NAFTA 3. When a nation imports more than it exports, economists say it has which of the following? a. a trade surplus c. a trade deficit b. a balance of trade d. a national difference 4. What happens when a nation s currency depreciates? a. Its products become more expensive to other nations. b. Its trade increases. c. Its products become cheaper to other nations. d. Its trade decreases. 5. What is a currency system in which each country tries to keep the value of its currency constant against one another called? a. a fixed exchange-rate system c. a floating currency exchange b. a flexible exchange-rate system d. a constant pricing system 6. How do countries protect their domestic economy from excessive influence by multinational corporations? a. by raising the price of goods provided by the multinationals b. by developing their internal economies c. by limiting the supplies of the multinational corporation d. by requiring the multinational to export a certain percentage of its product 7. What does a most-favored-nation (MFN) status mean? a. A country pays the same tariffs as those paid by all MFN countries. b. A country has a special exemption from all tariffs in the United States. c. A country has special licensing agreements with U.S. corporations. d. A country is exempt from product standards that make it expensive for goods to be imported. 8. Suppose the exchange rate between the United States and Japan changes from $1 = 100 yen to $1 = 110 yen. What would happen to the prices of American goods in Japan? a. They could increase or decrease. b. They will decrease. c. They will remain the same. d. They will increase. 9. What is a major disadvantage in the use of import barriers to make domestic goods cheaper? a. Domestic manufacturers create more jobs for both citizens and immigrants. b. Domestic manufacturers may lose the economic incentive to become more efficient. 2 c. Import manufacturers stop trying to send their goods to the country that has import barriers. d. The line between imported and domestic goods becomes harder and harder to draw. 10. What country is the world s largest exporter of services? a. Japan c. United States b. Germany d. Great Britain 11. What does it mean when an economist says that an area specializes in producing certain products? a. They use their resources to produce a limited range of goods. b. They produce only certain goods rather than everything they need. c. They produce only goods for which they have an export market. d. They use the money from their exports to buy food and fuel. 12. When the exchange rates are allowed to be determined by supply and demand, they are called which of the following? a. flexible c. direct b. fixed d. indirect 13. U.S. industries like steel, computers, and energy need to be protected from foreign competition to ensure which of the following? a. the economic advantages caused by their production b. the protection of these industries as they develop c. the presence of these industries during a crisis d. the incentive for these industries to become more efficient 14. What is an infant industry? a. a young or developing industry b. an industry making products for infants and children c. an industry that has tariff protection d. an inefficient but necessary industry 15. What is the European Union? a. a union of the six countries of the Common Market b. a pact between Europe and the United States regarding tariffs c. a regional trade organization of European nations d. a political amalgam of European and Asian countries 16. What economic status can the United States grant to countries that allows them to pay the same tariffs as other countries with the same status? a. voluntary export status c. fixed rate economic status b. free trade agreement status d. most-favored-nation status 17. Which of the following is an advantage for the host country of a multinational corporation? a. greater protective tariffs c. greater political power b. greater employment opportunities d. greater income from tariffs 18. Duty-free shops in airports and on international boats sell merchandise that can be brought into the country without which of the following? a. political embargoes c. restrictions on quantity b. import tariffs d. restrictions on resale 19. Which are the main trading partners of the United States? a. Germany, Great Britain, China, and France b. the Central American countries c. the European Union, Canada, Mexico, and Japan d. the Middle Eastern countries 20. Which of the following is a treaty to eliminate all trade barriers between Canada, Mexico, and the United States? 3 a. APEC c. CARICOM b. MERCOSUR d. NAFTA 21. In which customs union did the 12 member nations replace their individual currencies with the euro in 2002? a. Southern Common Market (MERCOSUR) b. European Union (EU) c. Caribbean Community and Common Market (CARICOM) d. North Atlantic Free Trade Agreement (NAFTA) 22. The currency in Great Britain is the pound ( ), and the price of a particular British car is 12,000. Suppose the exchange rate is 0.67 per dollar. What is the price of the British car in the United States? a. $52,174 c. $14,662 b. $17,910 d. $8, Suppose that there is a balance of trade in both the United States and Canada. Then, the U.S. dollar appreciates against the Canadian dollar. What would the likely outcome be? a. a trade surplus in the United States c. a trade deficit in both countries b. a trade deficit in Canada d. a trade surplus in Canada 24. Specialization in a nation leads to a. absolute advantage. c. international trade. b. self-sufficiency. d. comparative advantage. 25. Ed and Wendy decide to make extra money working at a local fair by painting names on coffee mugs and making sketches. Ed can paint 6 mugs or draw 2 sketches per hour. Wendy can paint 8 mugs or make 3 sketches per hour. Wendy has a. an absolute advantage over Ed. c. greater natural resources than Ed. b. more specialized production than Ed. d. a comparative advantage over Ed. 26. Ecuador has a comparative advantage in the production of bananas over the United States. Which of the following statements is true? a. Ecuador also has an absolute advantage in the production of bananas. b. The United States has an absolute advantage in the production of bananas. c. Ecuador can produce bananas at a lower opportunity cost than the United States. d. The United States cannot produce bananas. 27. According to the law of comparative advantage, a country should a. specialize and export goods with the highest opportunity cost. b. specialize and export goods with the lowest production cost. c. specialize and export goods with the lowest opportunity cost. d. specialize and export goods with the lowest average cost. 28. The United States placed a limit on the number of cars that can be brought into the country for sale. This is an example of a. an import quota. c. a customs duty. b. a tariff. d. a voluntary export restraint. 29. Suppose the United States decreases the tariff on imported tuna steaks. What would the consequences be? a. There would be a decrease in the number of imported tuna steaks and the number of tuna steaks produced in the United States. b. There would be an increase in the number of imported tuna steaks and the number of tuna steaks produced in the United States. c. There would be a decrease in the number of imported tuna steaks and an increase in the number of tuna steaks produced in the United States. d. There would be an increase in the number of imported tuna steaks and a decrease in the number of tuna steaks produced in the United States. 30. 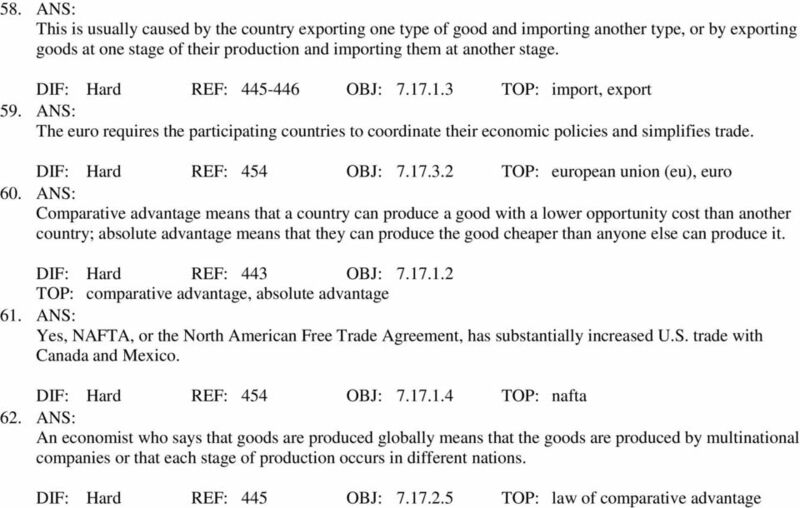 Which of the following is NOT an argument in favor of protectionism? a. Protectionism safeguards workers jobs. 5 Identifying Key Terms Match each term with the correct statement below. a. exchange rate f. protectionism b. balance of trade g. trade surplus c. trade deficit h. free-trade zone d. import quota i. voluntary export restraint (VER) e. absolute advantage j. import 43. a self-imposed limitation on the number of products shipped to a particular country 44. the relationship between a nation s imports and its exports 45. the use of trade barriers to protect a nation s industries from foreign countries 46. a region where a group of countries agrees to reduce or eliminate trade barriers 47. a person or nation s ability to produce a good at a lower cost than another person or nation 48. the result of a nation s importing more than it exports 49. the value of a foreign nation s currency in terms of the home nation s currency 50. the result of a nation s exporting more than it imports Short Answer Reading an Exchange Rate Table U.S. $1.00 $1.00 $1.00 Canada $1.55 $1.60 $1.35 Mexico 9 pesos 10 pesos 11 pesos Great Britain Figure According to Figure 17.1, which of the currencies shown has become stronger each year against the U.S. dollar? 52. According to Figure 17.1, which currency has the U.S. dollar become stronger against each year since 2001? 53. According to Figure 17.1, how many pesos was 1 Canadian dollar worth in 2002? 54. According to Figure 17.1, what is the currency against which the others are calculated in the chart? 55. According to Figure 17.1, how many pounds were $5 (U.S.) worth in 2001? 56. The U.S. dollar was worth increasingly less against which of the currencies shown in Figure 17.1? Essay Critical Thinking 57. Why is international trade better for all countries than an attempt for each country to produce everything it needs? 6 58. How can a country such as the United States be both a major exporter and importer of the same types of goods? 59. Twelve countries of the European Union have established a single currency called the euro. How does this benefit those countries? 60. How does comparative advantage differ from absolute advantage? 61. Has NAFTA succeeded as a way to increase U.S. trade? 62. What does it mean when an economist says that many goods are produced globally? 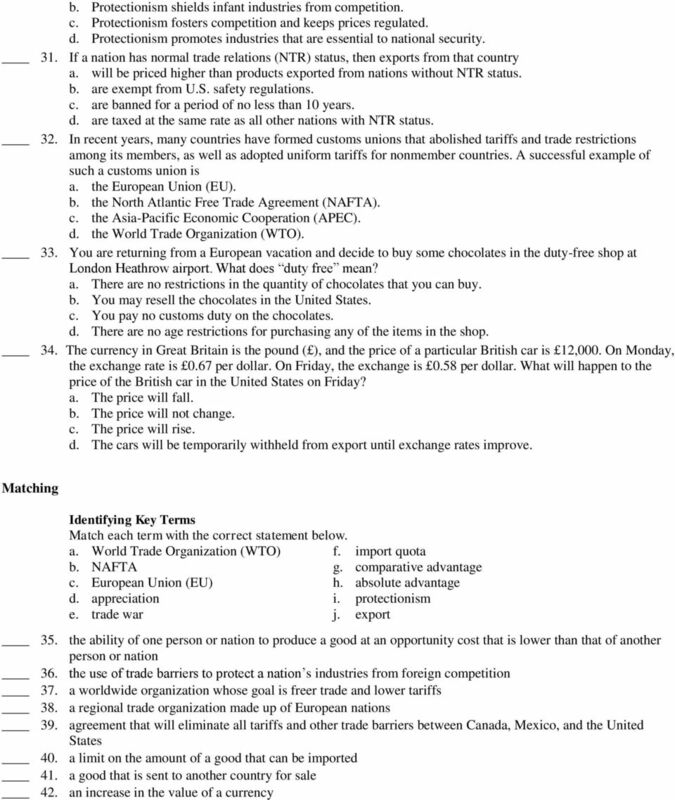 International Trade Multiple Choice Identify the choice that best completes the statement or answers the question. 1. A way to measure the economy's performance is to measure categories of national a. Global Economic Issues and Policies First edition Chapter 5 Regionalism and Multilateralism PowerPoint Presentation by Charlie Cook Copyright 2004 South-Western/Thomson Learning. All rights reserved. 1. CH 34. Name: Class: Date: Multiple Choice Identify the choice that best completes the statement or answers the question. Class: Date: CH 34 Multiple Choice Identify the choice that best completes the statement or answers the question. 1. Goods and services that the United States sells to other nations are called a. exports. Chapter 6 International Trade and Exchange Rate Volatility Thus far, we have focused our analysis on price risk. This price risk manifests itself in the form of variability in output and/or input prices.